Hi everyone. Last Sunday I had a play day with my two friends, Susan and Christine. We tried out lots of different techniques and products. So much fun!! And a bit messy too. What could be better??!! 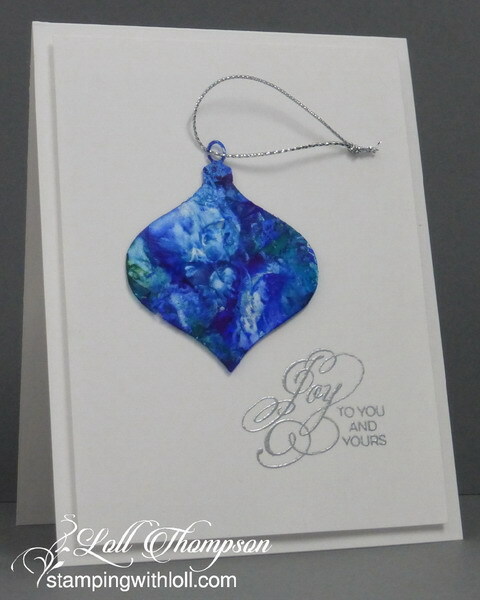 One of the products we were experimenting with was alcohol inks. There's little else that matches the vibrancy and intensity of AI colours. But they are messy and stain everything. We wore gloves (a MUST), and used parchment paper under our project (and over top of our silicone mats ... AI's will even stain the mats). The ornament above is cut from an acetate sheet (you could also use acetate packaging from your craft supplies). Alcohol inks work great on acetate. I wanted to take this opportunity to thank everyone who has sent me messages of love and support over the past while. I had several emails and cards after announcing I would be taking a medical break from my blog. After sharing my story about breast cancer two weeks ago, I have had many more wonderful messages and cards sent to me. It has been very uplifting receiving all these positive messages (emails and cards). I appreciate every one of them. I took a picture of my mantel with the cards. Look at all the gorgeous designs ... hand made by very talented card makers. Thank you so much!! Such a beautiful card, Loll. My major problem with alcohol inks is the strong smell, which is why I have been playing with them outside this summer. I did not have a hard time cleaning up, though. I happened to have this large pump bottle of alcohol-based hand sanitizer, which worked like a charm, both for cleaning my hands and for cleaning my craftsheet. Wow is that vibrant! It sounds so fun to do too and is something I'd love to try. How beautiful it looks on acetate too! Thanks for sharing another fun technique! What a gorgeous ornament! Wouldn't it be lovely on a real tree? Wow! What beautiful results, Loll, and a gorgeous ornament! And that silver embossed sentiment adds even more elegance! After these classes I need to get those alcohol inks out! I need a play date with you guys! Loll it looks awesome mounted on the card, CAS perfection. thanks for the play day. Beautiful ornament! I love blue but this is just breathtaking. Loll, it's gorgeous on that card! I will have to come up with a different way to put mine on a card!!! I love the photo of all of your thinking of you / encouragement cards - it is so heart-warming to think how many people were sending you support. Now you kmow how much I love using acetate... but it's an absolute (insert word of your choice) to cut out a die from - even with a metal cutting plate and multiple passes through a machine. What's your secret? Sounds like you've had a good week... and your card is amazing. Gorgeous and stunning! Thanks for sharing how you made this piece. Wow! And I'm so happy for you to be getting all the love and support. What a wonderful community. You are so giving and encouraging. It's coming back to you for sure. Big hugs! Sending prayers your way. Beautiful card. Thank you for sharing. Wow! What a beauty!!! Thanks for the tips on AI, as I've yet to try them. But then I think you could make mud look beautiful with all your talent!